Across the state of California, most municipal codes will require the installation of a backflow prevention device at each cross-connection point found within the plumbing systems of apartments, condominiums, food establishments, as well as most public and commercial facilities. The type of backflow preventer required will correspond to the level of hazards presented on the premise, and at Roto-Rooter, we offer backflow plumbing services to assist California business owners with these possible problems and offer them the best, most affordable solution possible. Potable, or clean, water flows under pressure through municipal water lines to homes and businesses. Backflow is the reverse flow of dirty water through the clean water lines. Dirty water can be contaminated with feces, pesticides, chemicals, fertilizer, and other hazardous materials, which can result in serious health hazards for residents and businesses if left untreated. 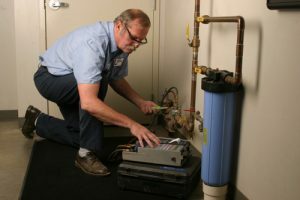 Backflow can occur at cross-connections between potable and non-potable water in any residential, commercial, or industrial system, making regular checkups and cleaning sessions on these systems important in order to prevent these problems. Roto-Rooter experts can treat these problems through installing preventative equipment as well as offering regular evaluations and testing services to assess the integrity of our equipment. A backflow prevention device most commonly consists of a pair of mechanical check values that prevent dirty water from flowing back into the clean water supply in the event of an unexpected or drastic change in water pressure. If properly installed and maintained, a backflow preventer will keep drinking water safe and free of contaminants. Our technicians can install these devices quickly and efficiently in order to keep your business secure from accidents. Backflow valves must be inspected annually to ensure proper operation and to keep your property in compliance with the local code. Your fresh water supply is subject to interruption and your business may be fined if backflow testing isn’t completed in time. With Roto-Rooter, businesses can schedule appointments with our experts in order to test their pipes for potential backflow problems and get it fixed without delay. Roto-Rooter technicians can perform annual backflow testing, repairs, installation, and backflow certification of all types of prevention devices. Your technician will handle all necessary paperwork relating to your annual inspection, then we will remind you when your next annual backflow test is due so your property remains in good standing with the local water authority. A Roto-Rooter backflow expert can also inspect your plumbing system to verify that your property is equipped with proper backflow device or devices. Call or schedule your backflow test today and rely on Roto-Rooter Ventura to help keep your property and water safe. 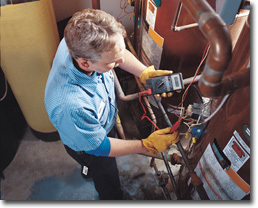 Roto-Rooter provides backflow testing services, drain cleaning, sewer camera inspection, septic system services, tankless water heater installation services, and other work in Agoura Hills, Camarillo, Fillmore, Moorpark, Newbury Park, Oak Park, Oak View, Ojai, Oxnard, Piru, Port Hueneme, Santa Paula, Simi Valley, Thousand Oaks, Ventura, and Westlake Village, California.